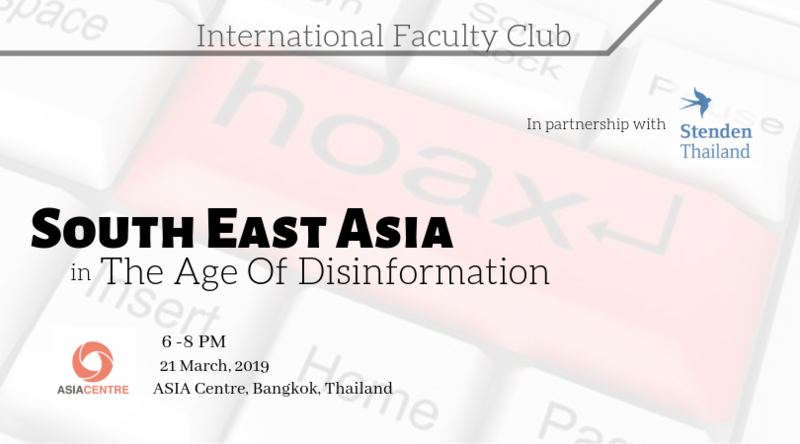 Asia Centre’s next International Faculty Club meeting examines some of the key challenges of disinformation in Southeast Asia and how it shapes our understanding of the region and beyond. In Southeast Asia there are more than 370 million Internet users. Internet penetration in the region is listed as 58% and social media penetration at 55% (Southeast Asia Digital, 2018). The use of mobile devices to access social media platforms has resulted in a shift in news consumption over social media platforms where content creation is immediate, decentralized, diverse, not subject to regulations or fixed standards and consumed in “bubbles”. Manufactured opinion, many of which false, are shaping our understanding of Southeast Asia and its neighbours. Social media has become home to state and non-state agents of disinformation who use anonymous online spaces to seed rumors and fabricate content. Asia Centre’s IFC brings together academics, researchers and graduate students living, researching, studying, working, or passing through Bangkok, Thailand. The Club brings scholars from all disciplines together in order to share their research interests, explore avenues for partnering on projects, facilitate fieldwork, circulate information on jobs, grants and scholarship opportunities, share conference and publication calls, introduce promising faculty and graduate students, exchange views on challenges to higher education, and other relevant topics of interest. The IFC meets quarterly and has no formal agenda. Scholars may wish to request short presentations (5-7 minutes max) on their current research or projects. Each meeting of the Club is convened by the Centre and a member of the Club. During IFC meetings, complimentary light beverages and snacks will be provided.